Ethernet is the technology used for interconnecting individual users, servers, and most networking devices on local area networks. However, most organizations are looking for more cost effective means of improving their wide area networking technologies. 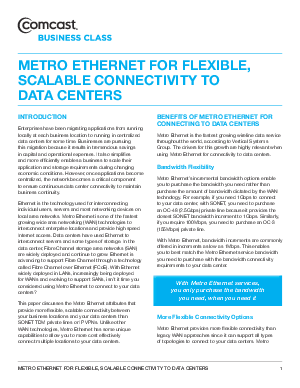 To find out more about how organizations are solving their problems, download this whitepaper to see how Metro Ethernet could be your solution and how it has six specific advantages over your current WAN technologies.